Acrobat Cracker is a program to recover passwords for Adobe Acrobat PDF files. Acrobat Cracker tool is a simple tool that can be used to decrypt password protected PDF files which have their "owner" password set. PDF files with the owner password set would prevent viewers from editing, selecting text, printing and otherwise changing any of the PDF properties such as form fields etc. This Acrobat Cracker tool will decrypt and remove owner passwords from any PDF document. The Acrobat Cracker tool will NOT work with PDF files that have a "user password" set. 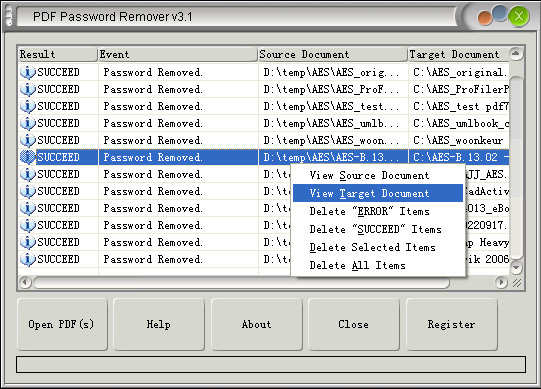 Please use this tool to remove passwords from PDF files that belong to you. It was developed to help you recover PDF files in cases where you forget the owner passwords you once set and can no longer remember. Copyright © 2000- VeryPDF.com, Inc. All rights reserved.